This article was authored by a guest contributor. If you have an article, story, or pictures you’d like to share, feel free to reach out to us at blog@americanexpedition.us. Thank you Gwen for another great piece! When nature calls, it often comes with a “survival of the fittest” type of mentality and those who are smaller, weaker or even cuter, can often become quick and easy prey for a number of different predators. 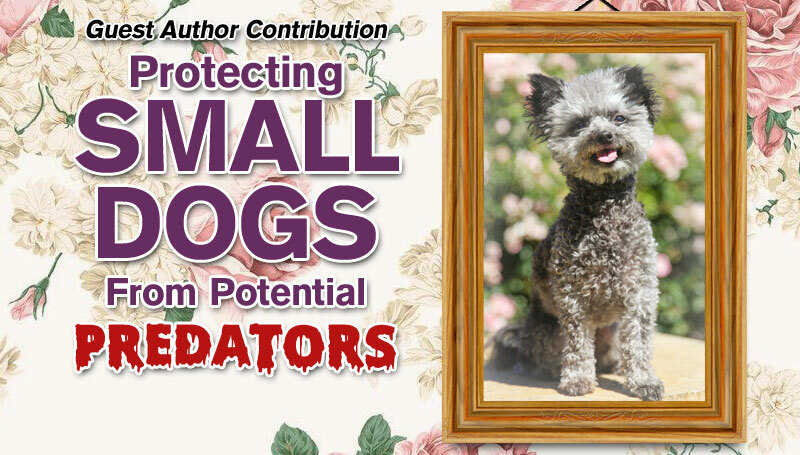 While it’s obvious that smaller dog breeds could be “easy pickings” for wildlife in general, there’s still a great deal we can do when it comes to preventing them from being a taken for granted in many of these potentially dangerous situations. While birds of prey making off with small pets may be the stuff that urban legends are made of, it still happens and there’s plenty of other threats to be found inside many of our own backyards. These encounters could easily harm, injure or even kill our precious pets. From the tiniest of mosquitoes to larger birds and other four-legged predators, it’s entirely possible that these animals could pose a significant danger to our pets. There’s an old saying in the construction industry that warns us to, “Look up to stay alive,” which is basically a warning for threats that can come from above. When you have a wee little dog, this same cautionary tale is true. Dangers can come from the sky and happen all around us when it comes to flying predators or those threats that can be found in trees. As responsible pet owners, we protect our dogs from airborne problems that come from mosquitoes with preventative measures like administering heartworm medication, but we can also look up to stop them from suffering from other possible types of trauma. Birds of prey and other animals like squirrels can seem harmless enough, but they can still attack without provocation and can carry plenty of harmful diseases transferred to our pets, including rabies and other concerns that are not all that uncommon. If your pet spends time outdoors alone, be sure you know who they’re out there with and consider keeping them indoors if it’s not safe. Regularly check the entire outside area for loose boards or defective wiring, holes or other routes of possible entry or escape. Make sure latches, hinges and these other types of devices are strong, secure and operating properly at all times. Look at other areas around the fence line where intruders can gain access especially along rooflines, from hanging tree branches, overgrown bushes, hedges, etc. Keep the grass and landscaping in and around this boundary well-trimmed year-round. After giving your outdoor area a good trim, remember to spray all your entryways with insecticide since these pests will become rattled when their living area is disturbed and could be looking for another place to stay inside your home. Potential predators and other nuisances like rodents, raccoons, skunks, porcupines and opossums often find shelter in unmanicured areas found in and around a yard. Don’t give these pests a place to nest near your home. Most of us aren’t fond of these nasty little pests that crawl and slither around and don’t pose a real threat. But sometimes a bite from one of these critters can be deadly for smaller pets. Venom from a black widow spider or a poisonous snake can kill if it’s inflicted on a tinier victim. Garages, sheds and other outbuildings are often breeding grounds for these pesky predators and are another area we should keep clean and clear so they don’t eventually attempt to move indoors. The best course of action is to keep all indoor and outdoor environments clean, maintained, well kept and this also includes outbuildings. Keeping a well-groomed and clean environment, both inside and out, is your best defense from potential predators, both large and small. When in doubt of any possible predators nearby, keep your animal indoors where they’re safe and sound. Gwen Lewis freelance writer living in Southern California. She writes on anything within the health and pets niche. She is very athletic and especially loves soccer. She is a dog enthusiast and loves spending time with her pets. You can read more of Gwen’s work on her website.